Huge power and amazing tone that fits in your rack rig. 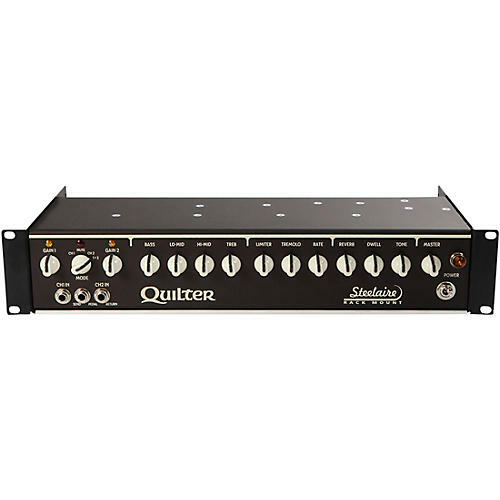 The Quilter Steelaire Rackmount is the solution for player who needs big power in a compact head. Equally at home in a rack or sitting gently atop your choice of cabinet, the Steelaire Rackmount represents the future of amplification technology. The Steelaire Rackmount utilizes a patented technology that combines a fully regulated switchmode power supply and proprietary class-D power amplification with our own secret sauce to add warmth and resolution normally reserved for hand-wired boutique tube amplifiers costing many thousands of dollars. Quilter starts with twice the normal input impedance to extract the maximum response from your instrument pickups. The engineers finish with a 400 watt internal power amplifier section, which they limit to a maximum output of 200 watts for speaker compatibility. The reserve headroom lets the speaker “breathe” and deliver a bigger sound. The high input and output impedances combine with the speaker’s natural frequency response curve to deliver even more tone than you thought possible, together with amazing amounts of unstressed power to your choice of speakers. Put simply, there is nothing like it.